ADELAIDE: An Australian Holocaust revisionist claims he has proof a mass grave never existed at Treblinka in Poland. Data collected during a week at Treblinka. using ground penetrating radar, found no soil disturbance consistent with 870,000 Jews having been buried there. Richard Krege, 30, of Canberra, said data collected during a week at Treblinka. 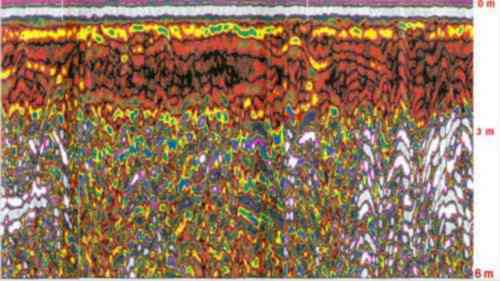 using ground penetrating radar, found no soil disturbance consistent with 870,000 Jews having been buried there. ‘Historians say that the bodies were exhumed and cremated towards the end of the Treblinka camp’s use in 1943. but we found no indication that any mass graves ever existed," he said. Mr Krege, who will address a public meeting in Adelaide tonight at the start of an eight-day tour, said he had gone to Poland in October last year to "find the truth". A qualified electronics engineer, he is an associate of the Adelaide Institute run by German-born revisionist Dr Fredrick Toben, whom he is accompanying on the tour. Mr Krege said he would like to see an international group formed, possibly under the auspices of the United Nations, to use ground penetrating radar at all concentration camps in Europe. He said he was in the process of having other experts review the data he collected, but was confident that they would also conclude the mass burial did not happen. The young Australian-born man admitted that he expected to be labelled a racist and anti-Semitic. What is this interesting pattern? A psychedelic painting? The Lord Chancellor's latest wallpaper? 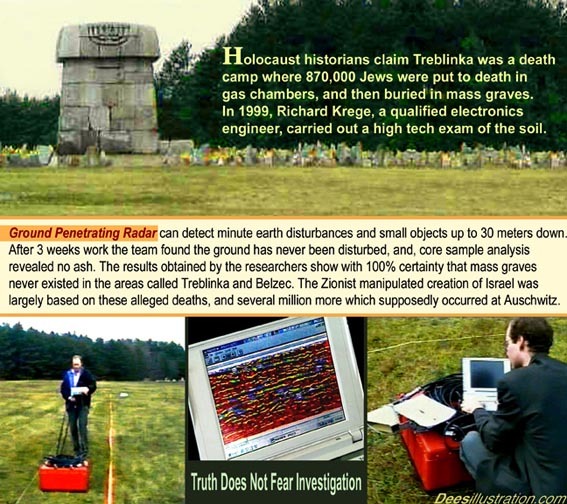 No, it is a Ground Penetrating Radar (GPR) scan of the alleged mass grave site at Treblinka, Poland, conducted to a depth of eighteen feet by an expert in November 1999: it seems the ground has remained undisturbed for millions of years. Clever old Nazis, in panic of defeat, managed to put back every stone exactly in place. ADELAIDE - An Australian Holocaust revisionist claims h has proof a mass gray never existed a Treblinka in Poland. Richard Krege, 30, of Canberra said that data collected during a week at Treblinka, using ground penetrating radar, found no soil disturbance consistent with 870,000 Jews having been buried there. "Personally, I don’t think there was a [death]-camp there at all." Mr Krege who will address a public meeting in Adelaide tomorrow night as the start of an eight-day national tour, said he had gone to Poland in October last year to find the truth". Secrets Facts - Treblinka, False Concentration Camp. Australian reasearches travels to Treblinka concentration camp, looking for signs and proof of massgraves. They found nothing.